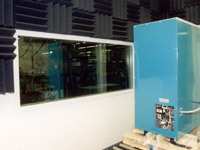 SonoCon acoustical testing and sound level measurement test chambers are engineered to precisely match the unique requirements of the customer. These include chambers to measure overall sound pressure levels in accordance with ISO and ASTM standards for product certification, quiet acoustically soft rooms for in-house product research and development, as well as enclosures to determine overall pass/fail sound levels often in production environments. 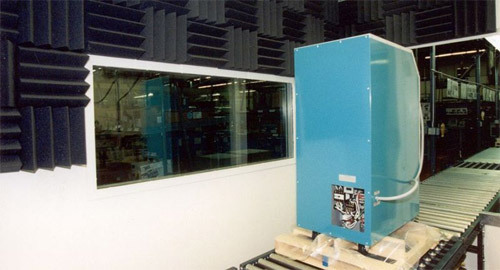 Most often, acoustical test facilities become a fixed part of the building. Constructed of factory fabricated components, they are shipped and assembled on site. These can be moved or re-configured as needs change. Portable chambers are used to isolate products from localized ambient noise and can be located as needed. These small enclosures can also be engineered as lift-off chambers to be positioned over a product for testing and removed afterwards. 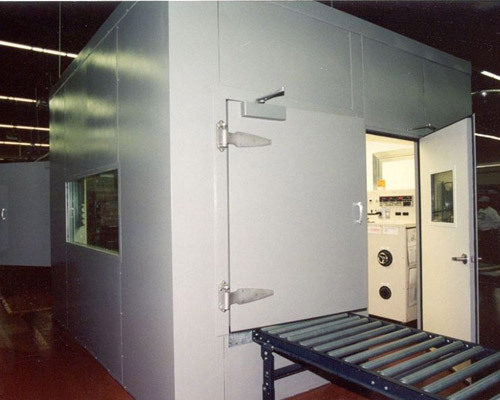 Additionally, SonoCon test chambers have been engineered to provide automated assembly line testing. Products are loaded or passed through a test chamber, sound level readings are taken, and the results fed into the production line program which automatically qualifies, labels or sorts the product. In some instances, existing building constructions can be modified to provide suitable environments for such applications as engine test cells, dynamometer test facilities, and other testing programs where noise levels are exceptionally high. Modifying an acoustically hard environment which is otherwise acceptable can be cost effective but its acceptability depends upon the type of test results desired.